For those who want a faster way of knitting, why not try finger knitting? It requires no needles and takes half of the time when traditionally knitting. Plus it is safe to do on the plane! 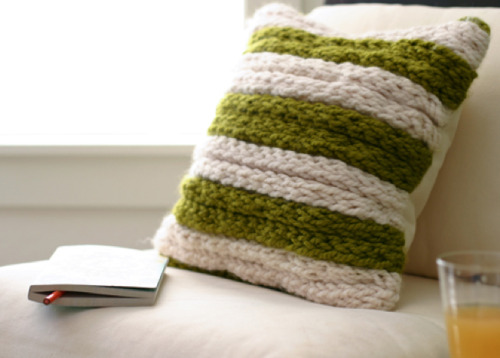 This super sleek pillowcase is knitted using an easy yarn-looping technique over your fingers and then sewing all the separate pieces together onto fabric to form the case. Visit their blog (Korean) for more DIY crafts and beautiful interior design: kiss my haus.